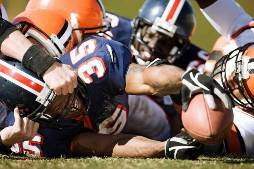 Home » Neurology » Are You Ready for Some Chronic Traumatic Encephalopathy? Are You Ready for Some Chronic Traumatic Encephalopathy? Ira Casson—neurologist, former co-chairman of the NFL’s panel on brain injury, and target of yesterday’s House Judiciary Committee hearing on football-related concussion—is technically correct: Data linking repeated head injuries in American football to lasting brain damage are limited. But as they say, absence of evidence is not evidence of absence. Moreover, a link is highly plausible, given the well-described association between repetitive brain injuries in boxing and neurologic deterioration—aka dementia pugilistica. To remedy the shortage of evidence on sports-related head injury, the nonprofit Sports Legacy Institute partnered with the Boston University School of Medicine in 2008 to create the Center for Traumatic Encephalopathy. The Center’s raison d’etre is to assess neuropsychiatric symptoms in athletes and to examine their donated brains for pathologic signs. The Center’s most recent publication, printed in July of 2009, provides a review of 48 cases of neuropathologically verified chronic traumatic encephalopathy, or CTE, in the medical literature and adds data from 1 professional football player and 2 boxers. The clinical picture of CTE features memory loss, behavior and personality changes, speech problems, parkinsonism, and other gait or movement disorders. Pathologically CTE is typified by nearly global brain atrophy and the accumulation of tau protein in neurofibrillary tangles. Consequently CTE is classified a tauopathy, like other neurodegenerative disorders (including Alzheimer disease); however, CTE can be distinguished from other tauopathies, the authors claim, by its predilection for certain brain areas (eg, the superficial layers of the cerebral cortex). Deposits of amyloid beta, typically in the form of plaques and characteristic of AD, are evidently not as common in CTE. In December, the Center also described postmortem CTE in an NHL player. In an effort to accumulate more data, the Sports Legacy Institute encourages athletes to donate their brains to the Center. Current Legacy donors are listed at the Institute’s website, along with links to their stories. Several of these cases were discovered by pathologist Bennet Omalu* and colleagues, who recently reported microscopic evidence of CTE in 5 professional athletes who attempted or committed suicide at relatively young ages. * Omalu is the author of Play Hard, Die Young: Football Dementia, Depression and Death. 01/06/10 addendum: While the effects of performance-enhancing drugs (eg, anabolic steroids) on mood and personality are well known, their role in the development of CTE is debated—largely because data in that area are lacking as well. The NFL case report described recently by the Center (former linebacker John Grimsley) indicated no reported use of performance-enhacing drugs (if you believe that a linebacker can escape the NFL without having used them). The role of the apolipoprotein E (ApoE) genotype in CTE appears to be more significant, however. Of the 10 CTE case reports in which ApoE genotyping was performed, half carried at least one APOE ε4 allele—a known genetic risk factor for Alzheimer disease. The authors suggest that ApoE ε4 carriers may be more susceptible to CTE.